More from the Rothbury Music Festival...Here is me, Monkey, Lucky, Scotty, Una, Stephanie Monseau, Sxip Shirey and Gravity Plays Favorites! We performed in the same tent as the BEST marching band ever- Pazzo Luna- from Chicago. Monkey and I spent the entire month of July gigging in NYC at The Box, Corio and more. We would ride our matching pink pom-pom bikes over the Brooklyn Bridge at the wee wee hours...this is the last Saturday of the month...after 4 weeks of 10 shows per week...with the sun coming up. We did the 3rd Virgin Mobile Music Festival in Baltimore at the beginning of August. 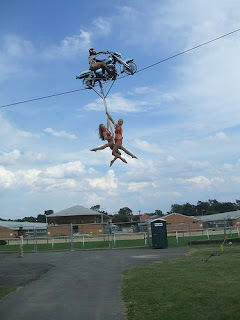 Una Mimnaugh of Circus Una invited us to perform in her MOTOR CYCLE THRILL SHOW! 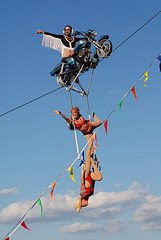 Totally amazing, Evil Knievel antics with a motorcycle on a 40' tight wire with two gorgeous trapeze gals beneath- all set against the backdrop of a blue sky at Pimlico Race Track! The Mermaid and Neptune were there too. We had 3 amazing weeks at home in Baltimore after such a busy summer. Bill Stevenson finished out our trip at the Baltimore Tattoo Museum with a design we've been talking about for over a year- it's a tribute to our dearly departed house rabbit, Mahatma Bun Bun.